Increasing website traffic may sound like a challenge and it is. 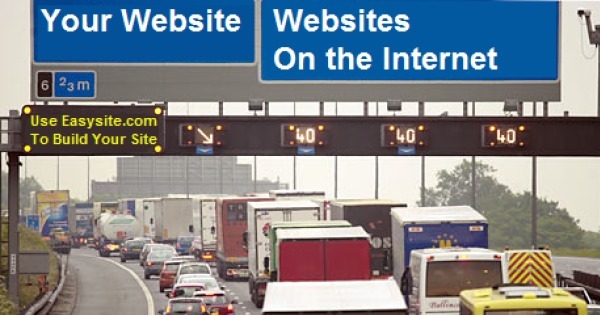 If you want to know how to build traffic to your website, read on. These are a few things that can give your site traffic a boost and build traffic to your website. Don’t have a website then click here to try Easysite free for 30 days. Do not be surprised. The domain name matters. You have to choose a domain that aptly describes your business. Include your main keywords in the name and keep it as short as possible. Do not have dashes in your domain as when you tell people they will probably forget the dashes and could end up at your competitors site. If you have not built a website yet then save some money and get a free domain name from Easysite.com. If you already own your own domain name, Easysite lets you hook that up too. Before you need to know how to build traffic to your website you will need a professional responsive website. A website built from the ground up. A website built with a website builder that is easy to use. A web site builder that has a great support team. Having a professional website is very important for a steady flow of free traffic. You can even create a professional website for your business or start an online store with Easysite. When you have created a professional website packed with quality content other websites will link to your site. Giving your site a free backlink great for SEO. When those other sites get visitors and the visitors read the articles and click your sites link in the article you get some free traffic. This is how to build traffic to your website from other blogs and sites. Your articles will also be shared on social networks such as Facebook, and Twitter if you have good content building even more free traffic to your website from social media sites. You can hire professional website designers to create a website for you. But they tend to charge exorbitant amounts for their services. So, be prepared to spend quite a lot. However, there are excellent website builders which you can use to create a website in a few steps. There’s no coding skills or technical knowledge required. One such builder is Easysite.com which helps you create a professional-looking website without any external help. It provides you with a professional “look” that you can change whenever you want. Not only that, it also has an additional service that lets you create a customized look easily. Your website must show up in the search results of Google and other search engines. A lot of people use search engines to find websites that provide what they need. Easysite is built with this in mind, to help search engines find your website. Every page of your site is created in such a way that Google and other search engines can easily index it. That means, your site will be easily found in search results pages and more people will be visiting it. Your site must be linked to your company’s social media pages such as Facebook, Twitter, etc. That makes it easy for your visitors to check out your content and engage by commenting on the content or sharing it. With website builders like Easysite its easy to create a custom web page, create an online calendar, post the latest news, post videos, add pictures and link your website with your social network pages. Not only that, it provides an option to place Facebook “like” buttons on your website. Easysite makes all the pages in your website ready for use. Starting from home page to contact us form, blogs to photo gallery, survey page to custom page – everything is ready and waiting to be used. Even if you would like to sell stuff online the store page is already set up, all you do is add your products and prices. Easysite makes it easy to sell your stuff online. That means complete peace of mind for you. You have to update your website pages regularly with shareable content. You can do that very easily when you use Easysite. No technical knowledge needed. Not only can you add new content but you can also add photos, change the background, the font, the sizes and alignment of the font and make links, all using Easysite. This level of convenience is rarely provided by any other website builder. Having shareable content is very important. Create content that your visitors can instantly share and spread the word around. A well-written, informative piece with a catchy headline and interesting image is the right shareable content you can create. Easysite’s social network integration helps your shareable content be shared faster and smoother. Optimising your website for Google and other search engines is essential to get more traffic. Though Easysite offers SEO-ready web pages, it’s important to do a few things regularly such as writing fresh, informative and engaging articles, interlinking blog posts, using relevant keywords in the titles, subheadings, body, images and alt tags; linking out to the authority websites that are in your niche, and setting up Google authorship on your blog. Advertising is probably the most obvious way to bring in more traffic to your site. Your options include paid search, social media advertising, and display ads. For more conversion along with more traffic, you have to target high commercial intent keywords. Competition for these keywords would be high and even cost a lot, but those things will pay off when you achieve your goal. Connect with those who are steering traffic towards your website. If a blogger has linked to your site already, acknowledge that you appreciate what they have done and get in touch with them to see how else they can help in the promotion of your content and ask how you can help do the same for their content. Talk to a renowned blogger to write guest blogs for you. When they write, they share their content to their audience. That means, your website can get a huge exposure with their help. Apart from these things, there are many other aspects of getting your website more traffic. If you want to further increase the traffic your site, get in touch with Easysite.com today.